One of the reasons I was so keen on doing an in depth review of the Ubiquity system was to look at both Revelations of Mars and Space: 1889 in depth. In particular I wanted to look at both versions of their Mars. Both have some very fun and very interesting ideas for their Mars. I think if I were to merge these into one game, say my "1901: An Æther Space Odyssey" game, I would have to make some choices. For starters I might jettison BOTH sets of Martians in favor of something more Barsoomian. Why? Well a couple of reasons. I really enjoyed the John Carter novels and liked the Martians in those books. The Revelations of Mars book is the closest to that. Don't me wrong, I like the Space 1889 stuff too, but even back in the GDW days it didn't grab me. Now the Space 1889 Venus, that is something I can get behind. As interesting as I find the Space: 1889 Martians, the Revelations of Mars Martians seem to fit the idea of "Barsoom" better. 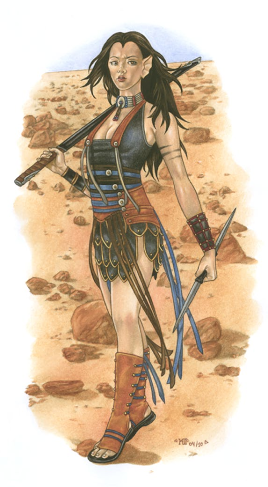 Also the other reason is that I have ALWAYS wanted to play a pure Sword and Planet game on Barsoom using either OD&D or Spellcraft & Swordplay. It would be nice to fully develop one Mars than to do two half-developed ones. I have toyed with the idea of playing one using Castles & Crusades too, mixing in bits of Amazing Adventures, but I think I owe it to myself to play it under OD&D. I would also love to figure out a way to get "War of the Worlds" mixed up in this. The Martians of that book are very, very different than any of the above. I could take a page from Mars: The Home Front on how to mix them. Though I like the idea of the Therns using the Sarmaks (the creatures from H.G. Wells Mars) as advance troops for the conquest of Jasoom (Earth). I also like the idea that the dwarf planet Ceres is somehow involved. In some ways I like Space: 1889's solar system better and RoM's Mars better. I have not gone over the histories of both with a fine tooth comb, but I can say that mechanically they will work with each other rather nicely. There is more to the solar system than just Venus, Earth and Mars. I think I would also want to have a Moon more similar to H.G. Well's moon than to Edgar Rice Burroughs' Hollow Moon from the Moon Maid. Though it would be the natural choice given the parallels to ERB's other works (Pellucidar and Barsoom). Heck, I could almost lift Space:1889 Martians off the planet and replant them on Venus/Amtor. That would work for me. I have not given much thought to the other planets yet. The four large Jovian moons are a good place to start, as is Titan. I think I am contractually obligated to use Pluto and make it into Yuggoth. It's nice to have so many options really. I really would recommend Thomas Denmark`s Warriors of the Red Planet for an old school take on Barsoomian Mars. Whilst I enjoy the background of Chadwick`s Space 1889 the rpg system was lacking at best albeit the Sky Galleon rules, the Ironclads and Ether Flyers,are still as sound as a pound when it was worth $5. I enjoy your blog immensely by the way.